First, it’s estimating the material to be used in the most efficient way possible, and then guiding the framer to use the material precisely as estimated. I’ve designed this Microsoft Excel lumber takeoff template to do both incredibly well. It optimizes your lumber takeoff, and converts your takeoff into Cut-Sheets for your framers to follow in the field. In addition, it becomes your framing lumber takeoff checklist, and also maintains running totals of all your counts. The best estimators understand that working from a checklist greatly reduces the possibility of missing takeoff items. This spreadsheet is designed to be your checklist. Here’s how it works. The template is organized into several grids. Each grid is a separate takeoff item organized by location and usage. In this pic I'm setting the location as 1st Floor and the usage as Headers from predefined selection list. You can set the next grid as 1st Floor Drop Beams, and so on. The idea is for you to create a master template containing all the various locations and usages tailored to your projects. As you begin estimating, you’ll start at the top of the spreadsheet, entering your counts of each lumber size and member length into each grid. By the time you reach to the bottom of the spreadsheet, it's highly unlikely you’ve missed anything in your takeoff. Turning out great takeoffs in the shortest amount of time requires uninterrupted focus. But, seriously, who has that luxury? Phones, email, text messages, meetings, these things never seem to stop. And with each interruption, you lose focus and sometimes your count. As you estimate, this spreadsheet keeps track of everything you count. Each click of the green + cell adds one to your count and each click of the pink – minus cell subtracts one from your count. Here’s a very basic sample of a 1st Floor Ceiling Joist takeoff. And here’s an example of how the pink – minus cells can be used for estimating structural plan options. Using this spreadsheet, you or anyone else can see what’s already been counted and what remains to be counted in your takeoff. Now, the only interruption that can make you lose count may be a power outage. Optimization has been a buzz word for lumber takeoffs for quite a while, but what does that really mean? To me, it’s making the best use of each piece of lumber. This is done by analyzing the length of each framing member, and then determining what’s the most efficient board to send out. For the past ten years, I’ve been using one simple method to optimize my lumber takeoffs, yielding extraordinary results in the field. Here’s the simplicity of this schedule. 5’ members are cut for 10’ lumber, 7’ members are cut from 14’ lumber, and the remaining short lengths are all cut from 12’ lumber. These are the default settings for the program, however they can easily changed if your trades are already programmed to do it any another way. Now the really cool thing is the software automatically optimizes your lumber takeoffs for you. All you need to do is count the size and length of each framing member. Imagine this scenario. You complete the best takeoff on the planet. Everything has been checked and double checked. Your lumber takeoff is even optimized for the most efficient use. And then you get a call from the field saying the framer needs more lumber and the scrap pile can easily fill a 40 yard dumpster. “Impossible”, you say. I’ve seen this same scenario play out time and time again. You may be the best estimator on the planet and use the best framer on the planet, but unless you’re both working from the same playbook, your once “great” takeoffs ultimately suffer. Now, when you get the call from the field, validating and defending your takeoff is a whole lot easier. 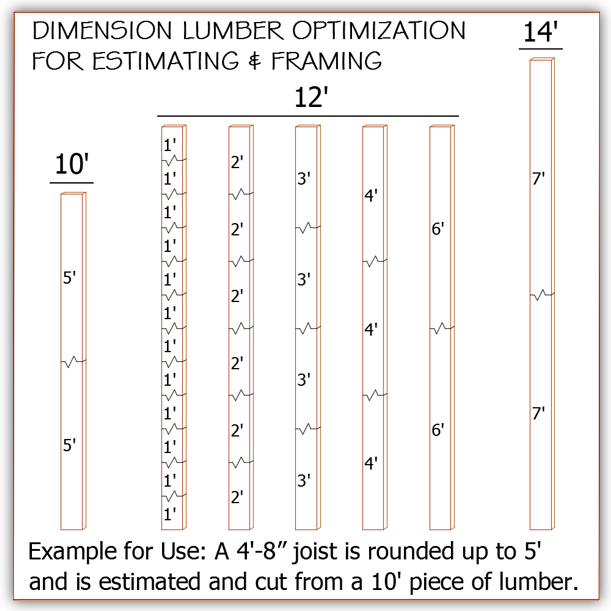 This template is not designed to estimate all framing lumber. Its sole purpose is to create very detailed and accurate lumber takeoffs for things like headers, beams, ceiling joists, rafters, stairs. Basically, framing materials that need to be estimated and cut from a specific size and length of lumber for your takeoffs to actually work in the field. If you’re ready to take complete control of your lumber takeoffs for good, click the button for immediate online access to this “Optimized Lumber Takeoff Template & Framer’s Cut-Sheet”, plus free online training and support that’ll get you up and running in just a matter of minutes. Not a Microsoft Excel User? If for some reason Microsoft Excel freaks you out, no worries. I’ve programmed the spreadsheet to do all the work for you. All you need to do is click buttons and enter numbers in cells. All you really need is Microsoft Excel 2007 or later and the desire to turn out some great takeoffs. If you’re still on the fence, I’m willing to take all the risk. I have a “Love It or It’s Free” policy on all my Excel estimating templates. If you’re not absolutely thrilled with your results over the first 21 days, I’ll give you all your money back AND you get to keep the software. If all this did was give you consistency and predictability in your takeoffs … would it be worth it? If all this did was free up your time … would it be worth it? If the logical answer is yes, click the button below for immediate online access.